Acoustics consultancy firm 21dB was tasked with installing a sound system that was able to provide an optimum audio experience for both live and recorded music in the opulent dining space. The company chose Genelec speakers as part of an intricate audio solution befitting of the restaurant’s sensory splendour. The spacious indoor expanse, high ceiling and large glass façade were considerable obstacles to designing an effective sound system which had to be integrated intelligently to provide high-quality music and an optimum acoustic experience. The client also required a clean aesthetic so as not to detract from the luxurious décor which was designed to resemble an antique oriental mansion. In order to achieve this, the subwoofers needed to be hidden from sight completely and the visible speakers needed to blend in with the background as much as possible. A Genelec system was chosen from distributors Eltek and a total of 19 Genelec 4040A installation loudspeakers were ordered in white and painted by an artist in a shaded light blue finish to blend into the restaurant’s décor. The seven Genelec 7070A subwoofers were either hidden in custom made perforated boxes or recessed into the floor with a steel grille on top which was made possible thanks to the floor thickness. Having dramatically improved the acoustic environment, the Genelec speakers provide a crisp and clean sound which can be played at any level whilst still maintaining the same level of definition in the music. Whenever live bands perform, usually traditional Arabic music, the sound from the speakers is natural and precise, delivering the best possible experience to diners. 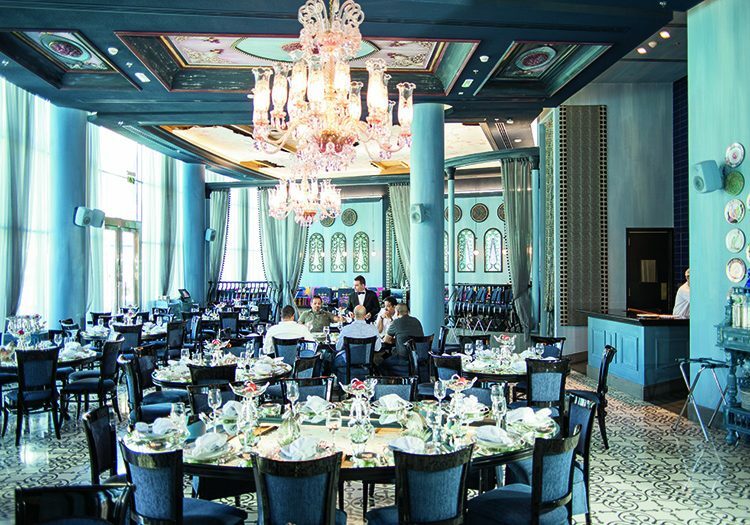 The sound system is a perfect accompaniment to the restaurant’s stunning food, service and ambience, and it also helps the luxurious Em Sherif to distinguish itself as a landmark in authentic oriental cuisine.